Denver Johnson, Missouri Southern’s head football coach, wasn’t kidding when he described the big impact the newest addition to Fred G. Hughes Stadium will have. At a staggering 63 feet high and 90 feet wide, the new video board will be the third largest in all of Division II athletics. 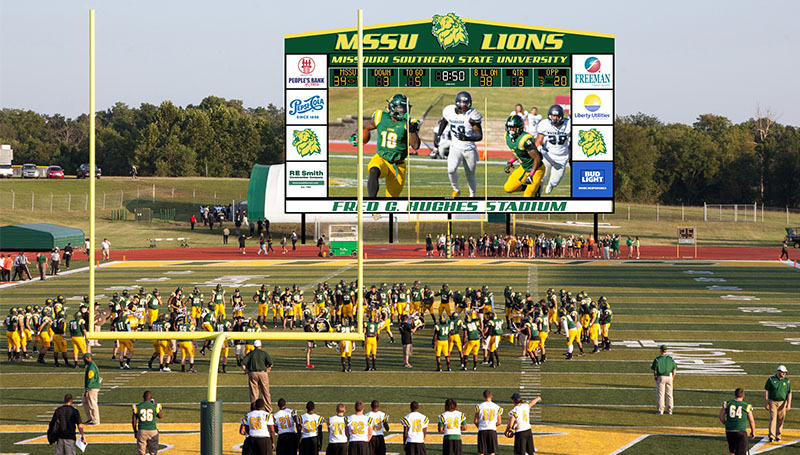 The $1.3 million project is being funded entirely by donor dollars and is part of a partnership between the Missouri Southern Foundation and Nevco, a national leader in video board development. The screen itself will be 30 feet high and 66 feet wide, with a display resolution of 718,000 pixels. The video board’s construction also comes with an entirely new stadium sound system. Project donors include People’s Bank of Seneca, Freeman Health System, Liberty Utilities, Missouri Eagle, PepsiCo and R.E. Smith Construction Company. In addition to football games, the new videoboard will be used for upcoming special events such as movie nights. It will be operated by students in the Department of Communication – offering an effective training experience for future broadcasters. Construction will be finished in time for the first home game on Sept. 8 against Lindenwood.